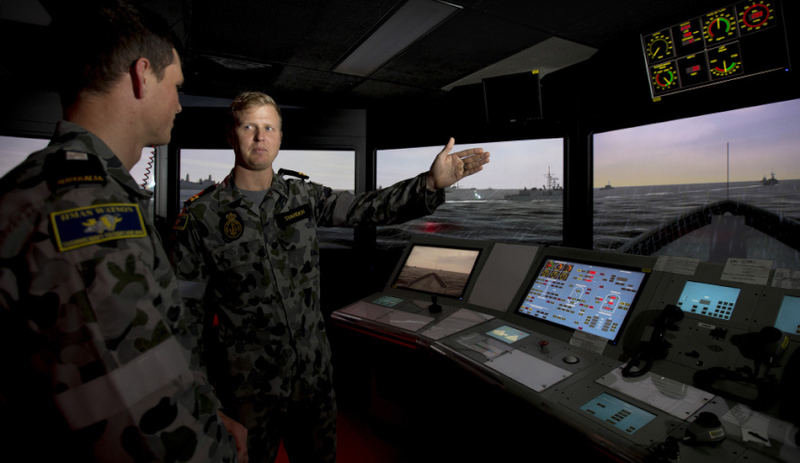 Lieutenant Chris Standon instructs Midshipman Harrion Rees in the bridge simulator at HMAS Watson. Image via Department of Defence. The Royal Australian Navy’s Sydney Navy Synthetic Warfighting Centre (NSWC) will be improved, with the government awarding a four-year contract to deliver local and distributed simulation-enabled training events for the RAN. Cubic Defence Australia (CDA), a subsidiary of Cubic Global Defense, has been selected as the primary contractor to provide a wide range of simulation planning, technical support and professional interactors to enhance RAN’s multisite synthetic training events at the NSWC, with the contract worth $9 million over four years. The NSWC was recently established at the HMAS Watson Naval Base on Sydney Harbour. The NSWC will facilitate synthetic training events and focus on delivering local and distributed mission training activities in both land-based simulators and ships in an agile manner. General manager of CDA Miles Macdonald said the company was excited to partner with the RAN to improve the NSWC. "We are proud to partner with the RAN in the ongoing development of the Navy Synthetic Warfighting Centre," said Macdonald. "We look forward to leveraging the expertise of our Australian simulation team and the best practices of our various global programs to aid the RAN in achieving world-leading capabilities for simulation-enabled individual and collective training." In addition to its partnership with the RAN, Cubic is the incumbent simulation support service contractor for the Australian Defence Simulation and Training Centre, which supports joint collective training. Cubic also provides training as well as simulation systems and services to the Australian Army and the Royal Australian Air Force.